This morning my son looked out the window and proclaimed ” Moon” while pointing out the window, sure enough there it was staring down at us at 6 am! For a simple art project like this I like to use different painting tools to enrich it. Gather your materials. 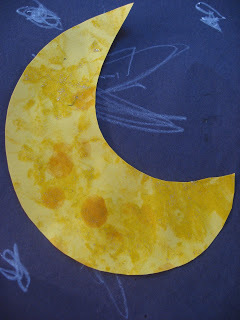 You will need one yellow and one black piece of construction paper, a white or yellow crayon, glue, sparkly paint and anything else to decorate your moon. 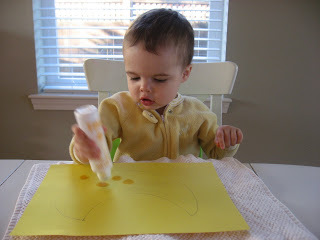 We used do a dot art dobbers, and a fun brush for our sparkle paint. Have your child draw stars in the night sky. 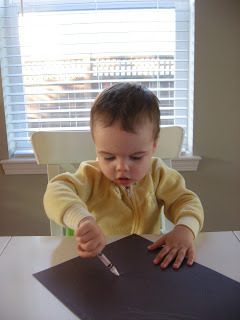 Using the white or yellow crayon color on the black paper. 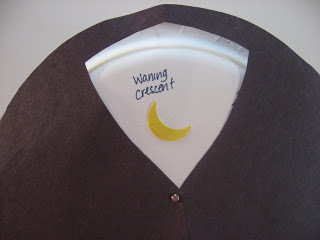 While they draw stars draw a classic crescent moon , don’t cut it out yet. Time to decorate the moon, we started with the dobbers. Then moved to the fun brush and sparkle paint. Let dry. 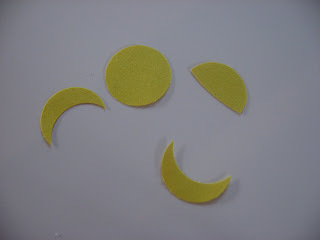 Cut the moon out and glue onto your starry sky! I do not suggest doing this with really young children, as you can see from the picture my son made a quick job undoing my work! 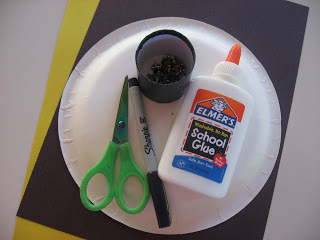 However if you have a school aged child this is a fun and easy activity for learning about Earth’s moon! Gather your materials. 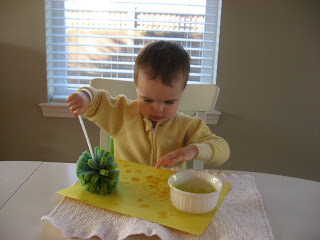 You will need a paper plate, some yellow and black paper, scissors, a fine tip marker, glue , and a brad. 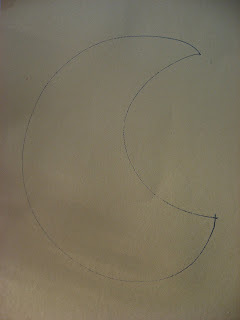 Using the paper plate at the template trace a circle on the black paper. Cut it out. 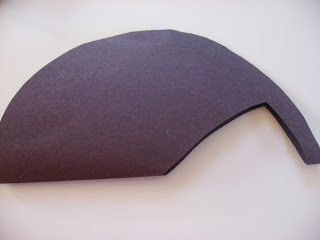 Fold the circle in half and cut a section out. This will be your viewing window. Set it aside. 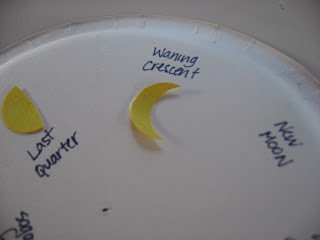 Using your yellow paper cut out the different phases of the moon, deciding if you will do all the phases waxing and waning . 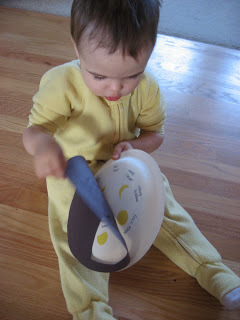 Write the phases name on the underside of the plate and glue the moon on, repeat for all the phases you are including. You may want to space this out before writing, to make sure you have enough space on your plate. Let dry. 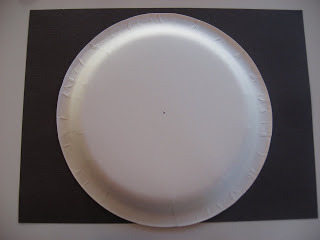 Poke a small brad through the center of the black circle with the viewing window and attach it to the center of the paper plate. Next Post: " Book" Your Travel ! My son and daughter are very into the moon. This would be a neat craft they both could do. 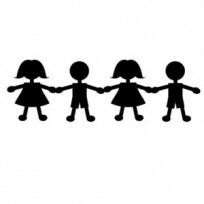 I love your blog and your ideas. Keep them coming. My 20 month old daughter loves the moon right now, too….probably encouraged by her current favorite book "Goodnight Moon". Any more suggestions for good "moon" books for the toddler crowd? You have such wonderful inspired ideas! I wish you were in OR so Jordyn & Owen could have a playdate! 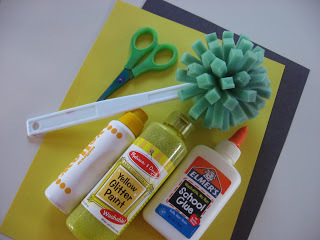 Where do you get the paint dobbers? I would love to have some! I got them at Michaels! Lakeshore Learning has great ones too! Tanya- Have you seem goodnight Mr. Night or Good night Gorilla- both are bug favorites around here! My 2.5 year old daughter also loves Eric Carle’s Papa, Please Get the Moon for Me. 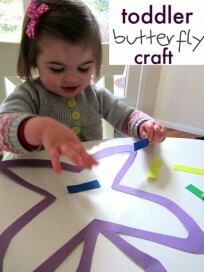 I just wanted to say that we made this craft today and it was a huge hit! My daughter is in a purple phase right now and wanted a purple moon. We used purple and pink paint and some purple glitter, and it looks so great!! I’m definitely going to keep it out for a Halloween decoration. I am so glad you have been enjoying it! My little man is still into moons, yesterday we covered the newly finished patio in blue chalk moons. I need to get that book out of the library, I own a million Eric Carle books but never seem to get that one in my book orders!